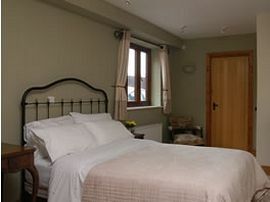 Character Barn conversion with modern bedrooms refurbished to a very high standard. 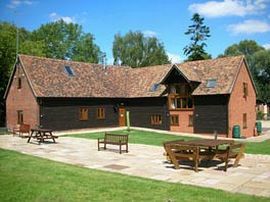 An enjoyable experience in a tranquil setting within the Hampshire countryside, Upper Neatham Mill Farm is a converted barn situated by the River Wey, surrounded by gardens and woodland which attract a variety of wildlife. Upper Neatham Mill Farm is on the border of the counties of Hampshire and Surrey. We have the advantages of a quiet peaceful location, whilst also having easy access to the A31, with the A3 and M3 only 20 minutes away. There is a direct rail link to London from Alton. Basingstoke is only 15 miles away, which has mainline train links north to Birmingham and Manchester, south to Southampton and Bournemouth, and south west to Exeter. 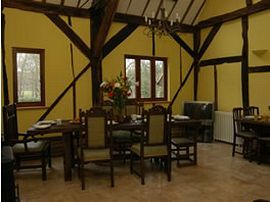 The perfect start to the perfect day in the UK, relax in our traditional oak beamed breakfast room with vaulted ceiling and exposed rafters, over looking the river Wey at Holybourne Hampshire. We believe breakfast is the most important meal of the day, which is why we offer our guests a healthy and wholesome selection. Whether your preference is a traditional cooked English or fruit and yogurt, the choice is yours. We use local and free range products from close to the Bed and Breakfast Alton Hampshire area wherever possible. We have spacious off road parking available for all rooms. 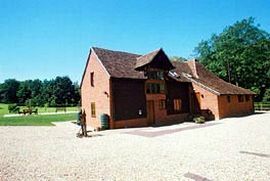 So whether your stay is for business, visiting the surrounding area, or a stop off en-route to the South-West, Upper Neatham Mill Farm is perfectly located. £35.00 to £40.00 per person per night. There is a £20.00 supplement for single person occupancy. Special Diets Provision: Special diets are catered for. Vegetarians. Disabled Facilities: There are disabled facilities. Full Disabled facilities for 1 room.